We are looking forward to our event with the one and only Frank Luntz later this month, and we invite you to be a part of it. Tickets are on sale now. Help us get the word out by letting your friends, contacts and social media outlets know about this important opportunity. 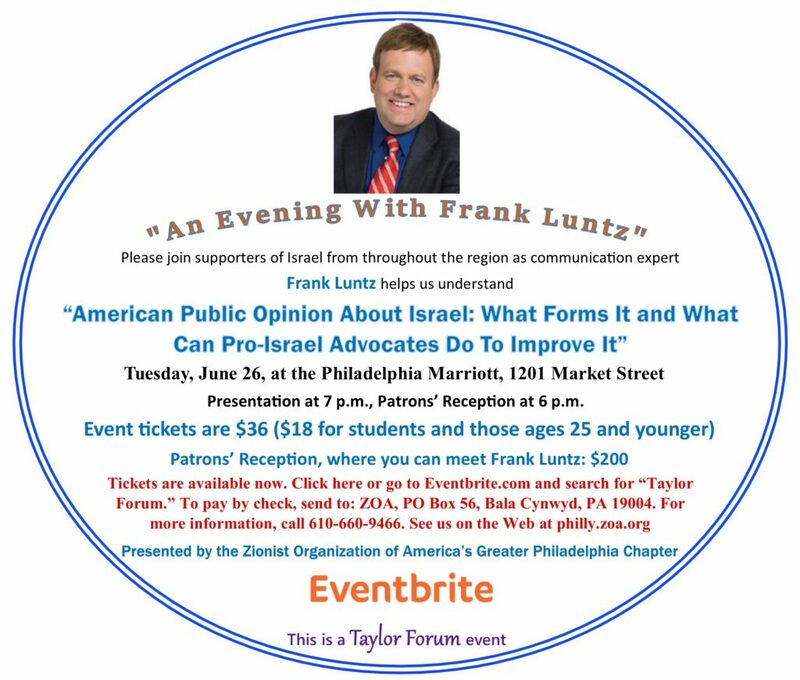 It is not often that one has the opportunity to hear from someone recognized as one of the world’s leading experts on communication – but you will on Tuesday, June 26, as Greater Philadelphia ZOA brings TV personality and public-opinion maven Frank Luntz to town for a Taylor Forum event. The event will take place at the Philadelphia Marriott at 1201 Market St. Luntz’s presentation will take place at 7 p.m. Tickets are $36/$18 for students and those ages 25 and younger. At 6 p.m., there will be an exclusive Patrons’ Reception with Luntz where you can meet him and speak with him – there will not be an opportunity to do so during the presentation. The reception will include glatt-kosher food plus wines from Israel. The reception will be limited to 40 people. 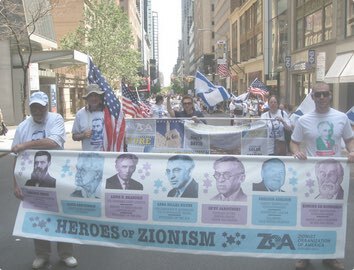 “An Evening With Frank Luntz” is taking place in memory of attorney and dedicated Zionist Jerome Taylor, who was a Greater Philadelphia ZOA board member. Spring Membership campaign winding down – Please Join or Renew Your Membership! 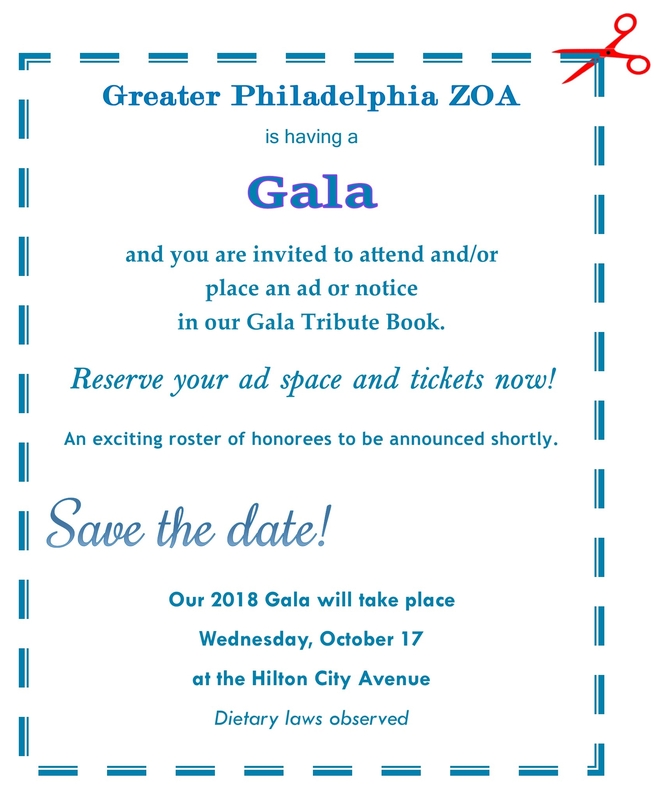 Greater Philadelphia ZOA is looking for volunteers to make calls for our upcoming events. You can either make them from our Bala Cynwyd office, or wherever is convenient for you. If you can lend us your time and talent, please call us at 610-660-9466. 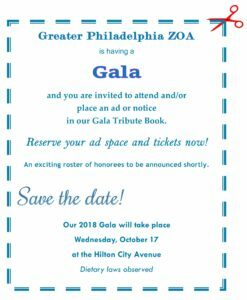 When Greater Philadelphia ZOA was in the early planning stages of our 2018 Gala, we announced prematurely that it would be happening in June. As you can see from the “Save the Date” notice above, it is taking place on October 17. We apologize for any confusion. Has the (unorthodox) organized Jewish community fallen off the rails? Unfortunately, too many of our co-religionists have indeed strayed and continue to drift so much so to the left that the question is: Has the (generally unorthodox) “organized” Jewish community’s religion become Leftism? There are disturbing trends.